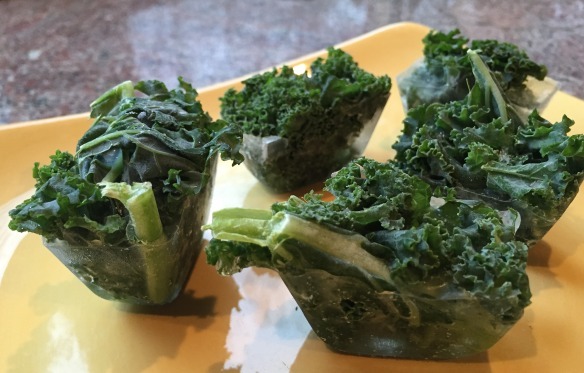 Healthy ingredients for smoothies…kale cubes! Turkey and dressing…mashed potatoes and green bean casserole…fresh bread, pumpkin pie and cheesecake. Yum. Ugh. Thanksgiving is over and it’s time to get back to healthy. A smoothie a day is a must in my diet, and Kale (my favorite veggie of all!) is a daily must. 1. Purchase fresh kale either in the bag or by the bunch. 2. Rinse and tear into 1” pieces. 3. Stuff as much Kale as you can into ice cube trays, firmly packing the greens into each cube as tightly as possible. 4. Run a little water over the ice cube tray, just until the water comes up to where it can hold the Kale in. 5. Freeze, remove and store in a plastic freezer bag.